Welcome, Guest. Please login or register. - Did you miss your activation email? Welcome to the Omage Combat Division of Star Trek Online! 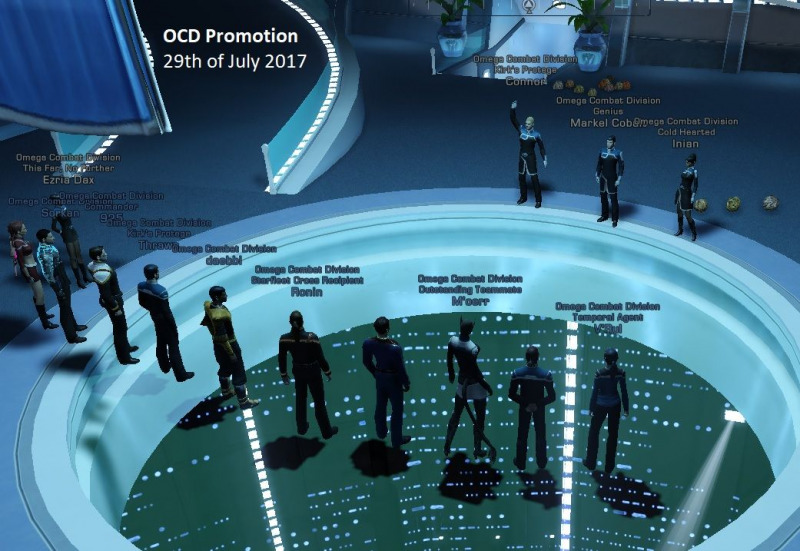 I wanted to take this opportunity to congratulate @seaofsorrows to the promotion to Supervisor in OCD and our spin off fleets. He has been very helpful to our community the past year in all kinds of areas reaching from representing us in the official forums over community channel invites up to detailed starship build advice. Teamed PvE is pure fun with him aboard. I hope we get a chance to promote a few others as well in the near future. Thank you for being OCD. I just wanted to take this opportunity to congratulate everybody who was promoted during the ceremony this weekend. Ussentiel and Seaofsorrows are now Elite Operatives in OCD and Heroes in OCB. Moerr will help to coordinate PvE from now on as Officer of our fleets. Last but not least Kyle and Ezria finally achieved the rank of Command Advisor/Council/Arbitrator of the Watch after literally years of service to our community. Their daily PvE runs not to mention their millions of star base contributions helped our community to thrive. I hope we get a chance to promote those we have missed the next few days. Thank you for being OCD all. EVENT: OCD treasure hunt: Where's Waldo? Starting this Saturday (7/30) at noon CST (5pm gmt) I'll be hiding a toon somewhere out there in the STO galaxy, and you'll be charged with finding him. Seems daunting? Never fear! Throughout the afternoon/evening, I will periodically be releasing clues to help you track down the treasure. What's in it for you? A Fabulous Prize! 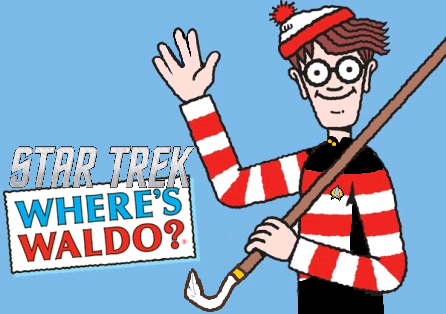 The first person to find Waldo will be awarded one STO game code that can be redeemed for (among other things) a T6 Andromeda class starship, the new Kelvin universe Starfleet uniform set, and a coveted Red Matter Capacitor! Good luck treasure hunters! See you out there this Saturday. Ever wanted a fun game to play within the game? Maybe a bit of a scavenger hunt to compete for the chance to win something awesome, like a Wells Class Temporal Science Ship? Well, soon enough you'll have that chance along with every member of OCD! Rachel's word is law. Why? Because in order to make it fair since I wrote the card and already found every item on it I will be moderating the game instead of playing it. Each screenshot must include your character name or ship name and the character race/ship class/ship name/profile info you are proving you found. Examples are attached to this post below. Every screenshot should be posted in your profile on this website inside your personal gallery. The only judge of whether or not a screenshot counts is Rachel. Why? See rule #1! However, if you aren't sure if your screenshot counts all you need to do is send me the link and ask me. As STO currently removes the User Interface from every screenshot taken using the game, you'll need to download and install a third party screenshot app such as MWSnap in order to show the information required. Any screenshot app you choose will be acceptable. For the good of the game no fleet member can use another fleet members account to cross out a box. For example, Latinum has a timeship, but because she is in the fleet Latinum's timeship does not count on the Bingo card. All screenshots MUST be posted before 12:00 AM on January 3, 2013 Pacific Standard Time (Greenwich Mean -8). It is NOT illegal to let your fellow fleet members know where they might find something on the card. The Game will start on December 27, 2012 at 12:00 AM Pacific Standard Time (Greenwich Mean -8) when the Bingo card is posted. All prizes will be chosen by lottery on January 4, 2013. Anyone who completes the entire card is eligible to win the Wells Class Temporal Science Ship as well as other prizes to be announced. Anyone who completes 5 boxes in a row (horizontal, vertical, or diagonal) will be eligible to win other prizes to be announced later. Anyone who fills their entire card will be entered into both drawings. Anyone who wins a prize will not be eligible to win another unless all others in the drawing have also won a prize. So get those screenshot apps ready, because you only have 7 days to fill your card! Good luck! We shall call the end of the extended play as noon on Wednesday, January 9th. Again, the time zone that will count for that is my own, which is GMT -8.